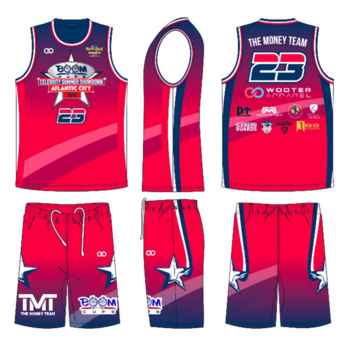 After designing and producing team basketball uniforms for star players like boxing legend Floyd Mayweather at the 2018 Celebrity Summer Showdown and charity event last August, Wooter Apparel is back with their customized jersey release as Boom Cups presents the 2019 Celebrity Pro Bowl Showdown on Saturday, January 26 at the CFE Arena in Orlando. 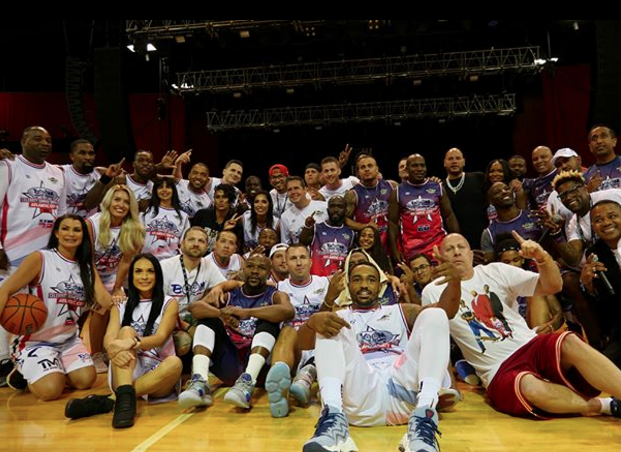 Wooter Apparel and Boom Cups know a thing or two about teaming-up to outfit marquee athletes and entertainers with customized team jerseys for a star-studded charity sports event. This time is shaping up to be even bigger and better than the last. On Saturday, January 26 at the CFE Arena on the campus of the University of Central Florida in Orlando, Florida, Boom Cups presents the 2019 Celebrity Pro Bowl Showdown with a charity basketball game benefitting the Chris Johnson Foundation and D-Up On Cancer (Update: Boom Cups Celebrity Pro Bowl Charity Game Recap). “Boom Cups and CEO Michael Mak have a gift for bringing amazing people from all parts of the sports and entertainment world together for a great cause and event,” said Alex Aleksandrovski, CEO of Wooter Apparel. 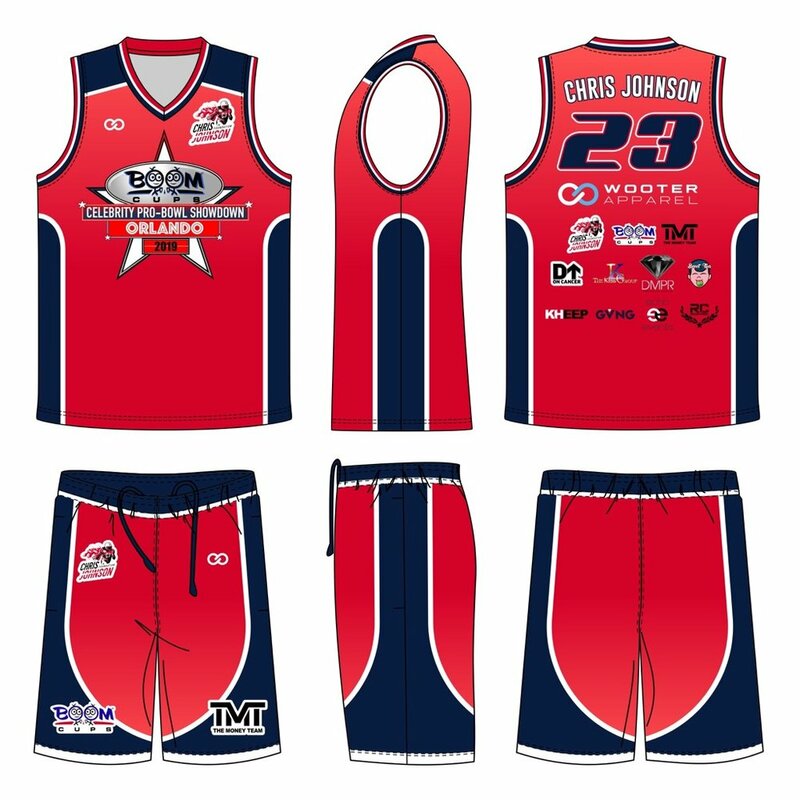 The customized team uniforms for this Boom Cups event pays homage to the Team USA inspired traditional red, white, and blue jersey color combinations for players, and are complete with matching warm-ups and Boom Cup logo sock sets. The action takes place at the CFE Arena on the campus of UCF when teams hit the floor for the Chris Johnson Charity Basketball Game & Skills Competition. An Orlando native, Chris Johnson is a former NFL running back with Tennessee Titans, New York Jets, and Arizona Cardinals. Before retiring from the league this past November after a 10-year playing career, Johnson was a 3-time Pro Bowl selection (2008-10) and led the NFL in rushing with the Titans in 2009. An Olympia High School alum, Johnson has remained dedicated to giving back to his local community and assisting families in need through his Chris Johnson Foundation. The 2019 Celebrity Pro Bowl Showdown marks another jersey collaboration between Wooter Apparel and Boom Cups. 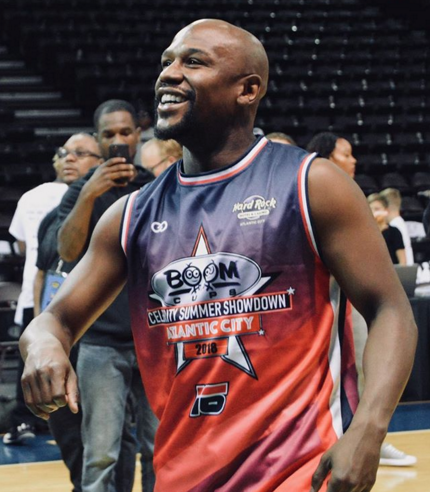 Last August, Wooter Apparel was selected as the jersey sponsor when Boom Cups held their 2018 Celebrity Summer Showdown and charity event in Atlantic City, New Jersey, featuring legendary boxing champion Floyd Mayweather. Mayweather joined a host of celebrities, current and former athletes, and entertainers to help give back to D-Up on Cancer, the Floyd Mayweather Jr. Foundation, the J.R. Smith Youth Foundation, and Hard Rock Heals. Among those who donned the customized red, blue, and white basketball uniforms from Wooter Apparel and were in attendance included R&B singer Tank, rap artist Jim Jones, pro basketball player Chris Smith, former WWE Superstars Ken Shamrock and Victoria, hip-hop artists Fat Joe and Lil Kim, former NFL player Jason Avant, WNBA players Ty Young and Cappie Pondexter, and Skeery Jones from Elvis Duran and the Morning Show, among many others. “Michael (Mak’s) success rate with Boom Cups has been exactly what he played it up to be a few years back for our first event together in Los Angeles,” said Nicole Brajer, E News Producer and BoomCups Media Coordinator. Along with Floyd Mayweather returning to the court, expect another impressive line-up come Saturday in Orlando. Coaches at the 2019 Celebrity Pro Bowl Showcase will include Todd Gurley, Von Miller, Bryant McKinnie, Keenan Allen, Dutchess of Ink, Wide Neck, Cappie Pondexter, and Nick Anderson, while players will include the likes of Ezekiel Elliot, Charles James, Travis Kelce, Chad 'Ocho Cinco' Johnson, Adam 'Pacman' Jones, Alvin Kamara, Maurkice Pouncey, Dominique Rodgers-Cromartie, Patrick Peterson, Jamal Adams,, Dee Gordon, Devin Hester, Renee Graziano, Rotimi, and many more. The halftime performance will be headlined by MMG Artist and Hip-Hop Moguel, Rick Ross along with Mario Winans and hosted by NSYNC’s own Joey Fatone and Young Scholar. “I am thrilled to join Mr. Mak alongside Chris Johnson and their charities this Saturday in Orlando with our Boom Cups team at CFE Arena in continuation to spread the word to large outlets like TMZ Sports and ESPN, who have featured our past projects,” added Brajer. For ticket information on the 2019 Celebrity Pro Bowl Showdown this Saturday in Orlando, Florida visit Ticketmaster here.